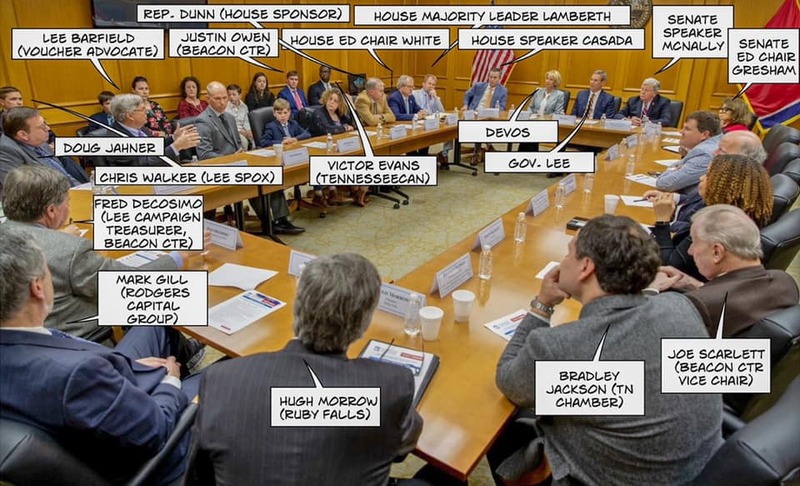 This picture from Eric Schelzig of Tennessee Journal tells the story of the private meeting with Governor Bill Lee, Education Secretary Betsy DeVos, and invited guests to discuss vouchers. This entry was posted in Bill Lee, Vouchers and tagged Betsy DeVos. Bookmark the permalink. It was a great meeting! Thanks. Not surprised to see you and the “freight train” of the free market there… ready to decimate our public schools so profiteers can keep getting richer. Thanks, Doug. Keep it up! I can’t take credit for decimating MNPS. You will have to thank a MNPS Board member for that. It’s “an” …so, I’m not sure where you went to school, but a grammar lesson is in order. It’s amazing that you, Karl Dean, and others blame the schools for the failure of society to take care of the least among us. Nashville has decided a certain segment of our populuation can and should be forgotten … left out. Our state has decided not to offer healthcare, a minimum wage/living wage, and basic security to those who most need it. Your own moral failing causes you to attend secret meetings with privatizers to feel better about the perpetuation of your reverse Robin Hood policy preferences. You are sad and you know it, so you read my each and very post, hoping I’ll post your picture or mention vouchers, or tell the truth about supposed “Christian” Bill Lee, your very own lord and saviour. I feel sorry for you, Doug. But, I’m glad you read me… keep it up, maybe your salvation is coming soon.